Money Q&A: Will I lose my child benefit next year? Q: I’ve heard that I might lose my child benefit in 2013, is that correct? A: From 7 January 2013, all households where one parent has an income of more than £60,000 will no longer be entitled to child benefit. Parents earning between £50,000 and £60,000 will be given a reduced benefit payment. This change is going to affect about 1.2 million families and, for those with two children, this could mean losing up to £1,752 a year. Throughout November all households where one or more adults earn more than £50,000 will receive a letter explaining more about these cuts. The calculations are made from your ‘net-adjusted income’, which is your income (salary, company car, shares, bonus etc) minus your salary deductions such as childcare vouchers, gift aid and pension contributions. The most confusing aspect of it is that the families who are told they will lose their benefit will still receive their monthly payment as usual, but have to declare their benefit on an annual tax form and pay a tax charge on it. 1) Contribute more to your pension. If you earn, say £53,000, you could contribute just over £3,000 into a pension and your net-adjusted income will be low enough to avoid the child benefit tax charge. 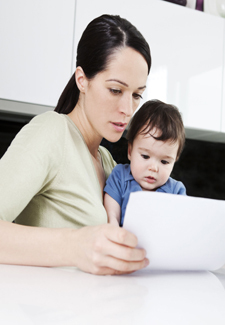 2) Take a proportion of your salary as childcare vouchers, which come tax and National Insurance free. If you join now, higher rate tax payers can opt to take a maximum of £124 a month in childcare vouchers, which can be used to pay for pre-schools, nurseries, after school clubs and holiday clubs. The childcare voucher deduction will lower your net-adjusted income and therefore increase the benefit you will be paid. If you haven’t received a letter from HMRC by the end of the month, and you or your partner earns more than £50,000, contact the tax office at hmrc.gov.uk and get the full child benefit cut rundown.